This is my first homemade fruit liqueur and it took two and a half months in the making. I finally bottled it over the weekend. Chris and I toasted to buying our first home. Looking forward to making more liqueurs in the new place. Salud! Gently wash all your raspberries and dry them on a paper towel. Check all of the raspberries and discard any that has mold. Place raspberries in a sterilized glass jar with a tight fitting lid (I used a 1 1/2 liter vessel) and crush them with a wooden spoon. Pour vodka and stir mixture. Store in a cool dark place for 1 month (You can store this longer if you desire or have the patience). Stir or shake the liqueur once a week. In a small sauce pan, combine water and sugar to make your simple syrup. Stir and let the mixture come to a boil and turn of the heat. Let the simple syrup cool before adding to the jar. 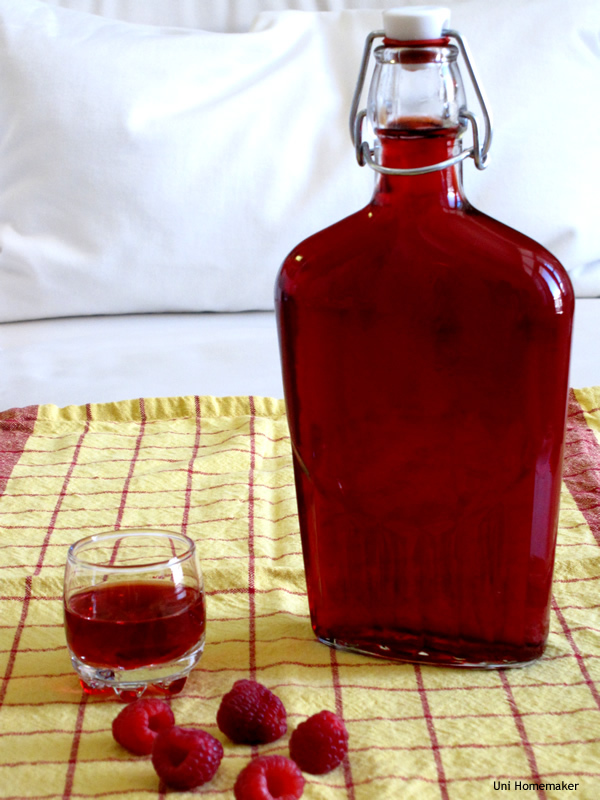 Add syrup to your raspberry and vodka mixture and stir. Store the jar back to its place and let it sit for another 1 month (or longer). After aging for a total of 60 days (or longer if you desire), strain the liqueur through a fine mesh strainer first and then pour it through the funnel lined with a coffee filter to strain away any impurities left over. The end result you get a much clearer liqueur. Store in a sterilized bottle with a tight fitting lid (I store mine in a 17 oz swing top glass flask with leftovers for drinking). Serve this chilled. wow! congratulations, a new home! that’s so exciting, Anne! and this tasty liquor seems just the thing you need to celebrate! I might try to do something like this for the holidays. Wow, impressive! You are doing amazing things with vodka + patience. Congratulations on your new home! What a delicious way to toast to the special occasion :). Gosh I can’t even imagine when I’d be able to purchase my own home… not for the next ten years at least! Just the title had my mouth watering. Oooh, strawberry liqueur is a good one too. I will probably do that one next May/June when strawberries are at their peak. Congrats on the home and the liqueur. Raspberry was my first too… Now I can’t stop! We have a lot of infusion ideas on our site if you are interested. They make great holiday gifts! What a great idea! Looks scrumptious and definitely would make a lovely gift! This looks good. Yesterday I made crema di limoncello (limoncello cream) I’ll share the recipe on my blog soon I will try your recipe too! I have a legit question. What percentage of alcohol do you use? Brand maybe? && congrats on the house and homemade recipe! Hi Ace: I used 80 proof. The brand I used was Smirnoff. Try it with the chocolate vodka. I have done this with oranges, strawberries and blackberries. Talk about yummy!